Devilry is a flexible and powerful role oriented system for handling electronic deliveries. Devilry is focused and user-friendly. 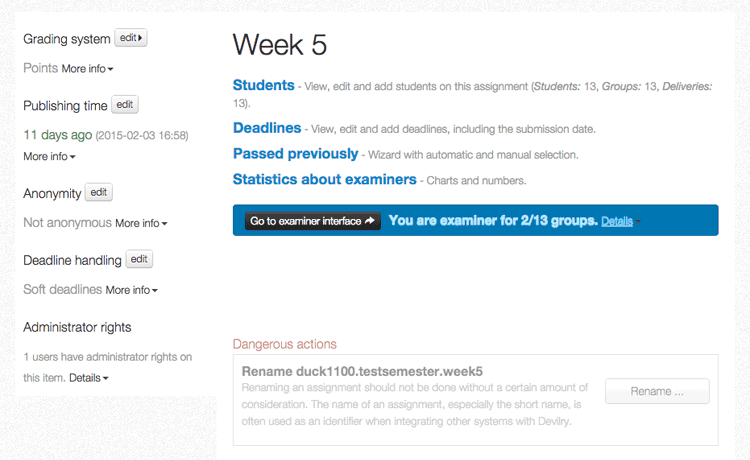 Devilry is a complete tool for course administrators that want to have full control over their assignments, students and examiners. Devilry provide an advanced toolkit for administrators to monitor students progress. Devilry afford intelligent assignment wizards for easy setup. Devilry is a system optimized for delivering and correcting electronic deliveries. Submit bugs or suggest improvements via our issue tracker, or help other users on our forum. Open source and open community means that you can help us develop Devilry. Get involved. Join a open and friendly community. Join us on Facebook. We appreciate comments and guiding input from the community. Suggest improvements and report bugs through our issue tracker, or discuss broader topics in our forum. There are many ways to contribute to the Devilry Project. Teachers, professors, teaching assistants and students among others are providing essential knowledge and insight to keep the system alive and updated. Everyone is welcome to participate in the open and including community of Devilry. Do not hesitate to jump onboard if you eager to ease the daily tasks for students, teachers and administrators. No contribution is considered to small. About Devilry. Why people love it. 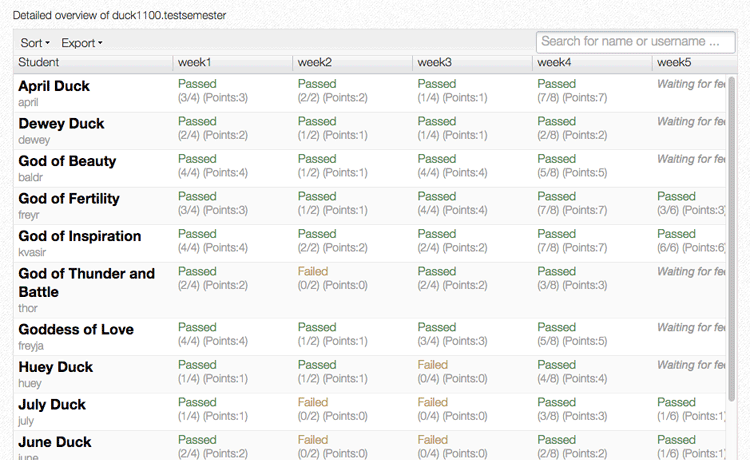 We focus on making it efficient and easy to provide feedback to students. This lets teachers/correctors focus on giving good feedback instead of other administrative tasks. 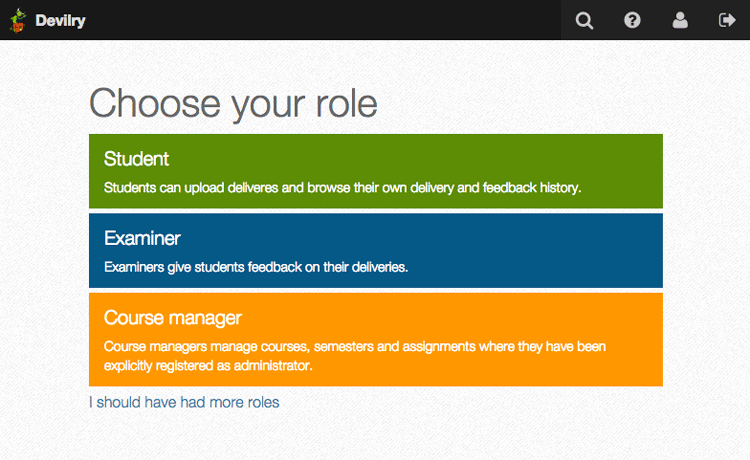 We provide a minimalistic user interface for students, where they upload deliveries, and view feedback, and a sleek and intuitive user interface for course administrators and higher level administrators. Devilry is designed with higher education in mind. This means that we do not cluttre the system with any of those artifical and uneeded constructs, like classrooms or folders. Instead, we try to give each user the shortest and most intuitive path to perform their tasks. 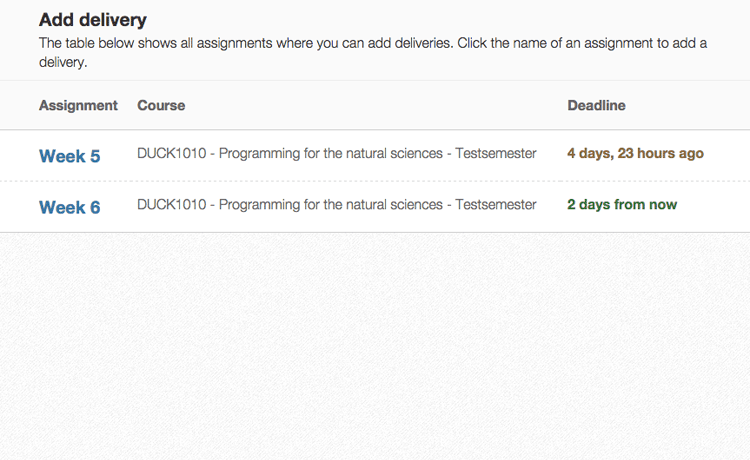 The system can handle all kinds of deliveries from source code to essays. 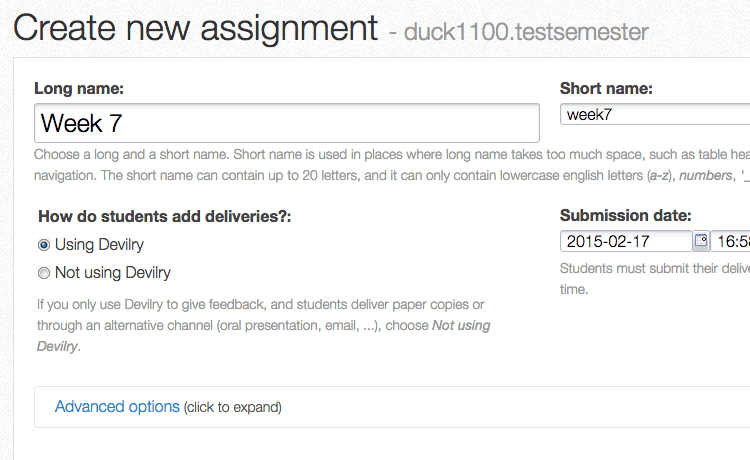 On top a simple and easy-to-use delivery layer Devilry provides a sophisticated interface for examiners and teaching assistants to manage students and deliveries directly in their favorite browser. Course administrators are given a focused interface to be able to easily manage all formalities around course management, from task deadlines to exam lists. Devilry started out in 2008 by a group of students at the Department of Informatics, University of Oslo with a vision to improve the current solutions around deliveries of obligatory assignments. It is currently the main delivery management system used at the Department of Informatics, UiO with plans of expanding to span across all departments at the The Faculty of Mathematics and Natural Sciences, UiO. Get help. Or help someone else. Visit our issue tracker and submit or help with bugs and suggestions. Visit our forum to get help, or to discuss all matters concerning Devilry. Follow the links below to go to the appropriate parts of our documentation. All our documentation is open source projects where anyone can contribute. For the User and Sysadmin docs, we have a big green box on the frontpage with more info. All you need is a GitHub user. The Wiki is open for anyone with a GitHub user. You can contact the developers by email. This is only for contact requests that does not belong in the open contact channels, like the issue tracker, or the forums. This mailinglist is typically for those that need private and direct contact with the Developers, and requests belonging in the other contact channels is ignored. If you have read and understand this, feel free to contact us at devilry-contact@googlegroups.com. Develop Devilry. Get started today. Developers can clone our repository at GitHub and start right away. The Devilry Developer Documentation will guide you in the right direction. Feel free to consult the forum for further help on all matters concerning Devilry. The Devilry source code is released with the the BSD license, which is an open source license.